As the title says, two nights of good music for an even better cause! If you need even more good reasons to visit, then we propose you use the opportunity to visit „Flaming Star“ the recently opened, collectively owned and operated, shop/gallery/meeting point right in Goettingen. Am Donnerstag den 02. Juni und Samstag den 04. 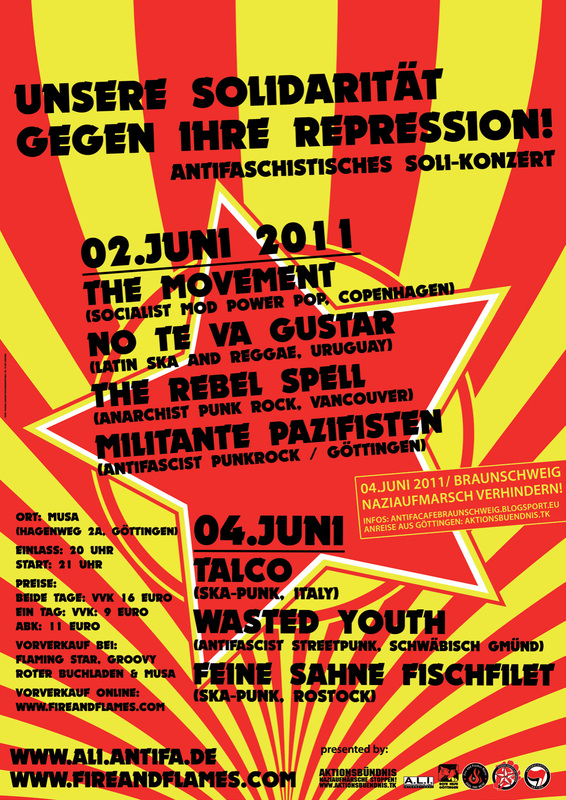 Juni veranstalten Fire and Flames Music und die Antifaschistische Linke International zwei Benefizkonzerte unter dem Titel „Unsere Solidarität Gegen Ihre Repression“. Ziel ist es Geld für im letzten Monaten von Repression betroffen AntifaschistInnen zu sammeln. Die Konzerte finden in der Musa statt und werden vom Bündnis Gegen Rechts Goettingen, der Roten Hilfe, und der Jugendantifa Goettingen unterstützt. Am Donnerstag geht es los mit internationalen Acts wie „THE MOVEMENT“ aus Kopenhagen, „NO TE VA GUSTAR“ aus Uruguay oder „THE REBEL SPELL“ aus Kanada. Unterstützt werden die von der lokalen Band „MILITANTE PAZIFISTEN“. Dieser Abend bietet sogar zwei „Headliner“ – mit „The Movement“ betritt eine Szenegröße die Bühne, während „No Te Va Gustar“ eine der heutzutage bekanntesten lateinamerikanischen Latin Ska und Reggae Bands ist. Mit einem Lineup von Power Pop über Latin Ska Reggae zu Punkrock sollte jedeR etwas für sich finden! Am Freitag Abend haben wir bewusst kein Konzert veranstaltet, damit alle die Möglichkeit haben Samstag früh gut ausgeruht nach Braunschweig zu fahren um sich dort dem geplanten Naziaufmarsch im Weg zu stellen. Am Samstag Abend geht es weiter mit Ska aus Italien von „TALCO.“ Unterstützt werden sie durch Skapunk von der Rostocker Band „FEINE SAHEN FISCHFILET“ und Punk Rock von „WASTED YOUTH“ aus Schwäbisch-Gmünd. Alle Informationen rund um die Konzerte findet ihr weiter unten. For those you planning on coming from other cities, we strongly suggest making use of the online „Vorverkauf“ option, which you can find here. All other informations regarding the concert you can see on the flyer image. Faithful to the Fire and Flames style, a night as international and musically eclectic as ca be. Starting with up and coming Göttingen punk band MILITANTE PAZIFISTEN, followed by catchy anarchist punkrock from Western „Canada“ from THE REBEL SPELL, continuing with Latin ska and reggae from Uruguayas NO TE VA GUSTAR, to end with power pop played by Copenhagens THE MOVEMENT. No Te Va Gustar, Latin SkaReggaePunk from Uruguay. The Rebel Spell, New addition to the Fire and Flames Music family, and visiting Göttingen as part of their first European tour presenting „A Beautiful Future.“ A must see! Militante Pazifisten, Engaged young Punkrock from Göttingen, sadly as far as we know with no video. Talco, Needs almost no introduction, one of the finest political skapunk bands around, from Marghera (Italy). Niedersachsens „most significant left-wing extremist concert organizer“ (for the second year in a row, says the Verfassungschutz!) Fire and Flames presents you two evenings of musically diverse entertainment, and all for the good cause of supporting those faced with state repression in the aftermath of some very successful anti-Nazi activities of the recent months. This is also why we took the very mature decision of not organizing a concert on the night of the 3rd, so that you can all get a good nights rest before heading to Braunschweig and handing the Nazis their next fiasco. After that, we again celebrate in Göttingen! The classic December „holiday season“ newsletter…further below you will find the actual news, such as releases from Los Fastidios, Talco, The Movement, Opcio K-95, or the „Rote Hilfe“ benefit double CD. 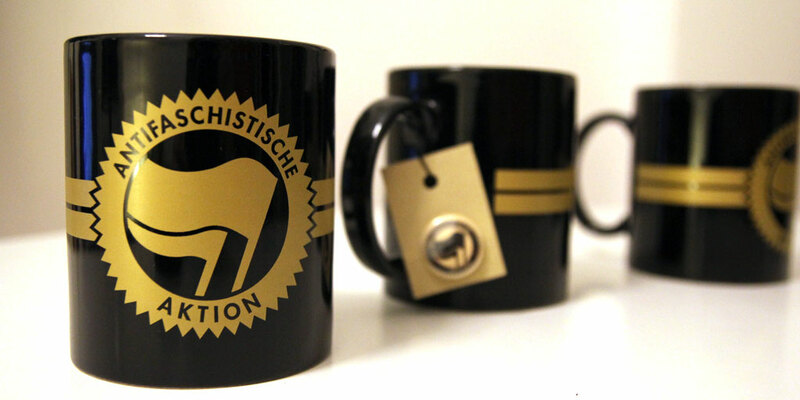 As well as of course the usual gift suggestions in the form of books, agendas, antifa cups and mugs, gift certificates, and so forth. But before, we would like to briefly recap the year which is almost behind us, as for Fire and Flames it has been a year of much growth and re-organization. Fortunately, this has been quite a successful process and those of you who are paying attention will have quite likely noticed the changes. Our spring collection was by far our most impressive yet, the winter collection is a crazed show of megalomania with some great successes (and true to our style, of course some spectacular failures and unexpected problems), the Fire and Flames festival made its return, new releases from the likes of Opcio K-95, Brixton Cats, and the upcoming „Rote Hilfe“ sampler were produced, and those of you who order from us will have certainly noticed…orders are shipped quickly, the communication is greatly improved, the catalogue is usually up to date and correct, and updates are frequent. The more time passes, the more that nothing changes. So by now we know that you will all go crazy because it is Christmas time, and in all honesty we kind of appreciate it (as you can imagine, all our festivals, collections, and records arent made for free!). But before we tell you all the new and exciting news, to make the “holiday” experience less stressful for everybody (especially us), here are again some important reminders and comments from last year, and the years before…. of “Cash on Delivery” orders) at the latest on TUESDAY 21.12! Outside of Germany (most of Europe)…SATURDAY 18.12! -Its very helpful, and increases the chances of a timely delivery, if you send us your telephone number together with your order, so that we can quickly contact you in case something is missing. So, let the insanity begin (or better said continue, you have been keeping us extra busy already since about a week ago). 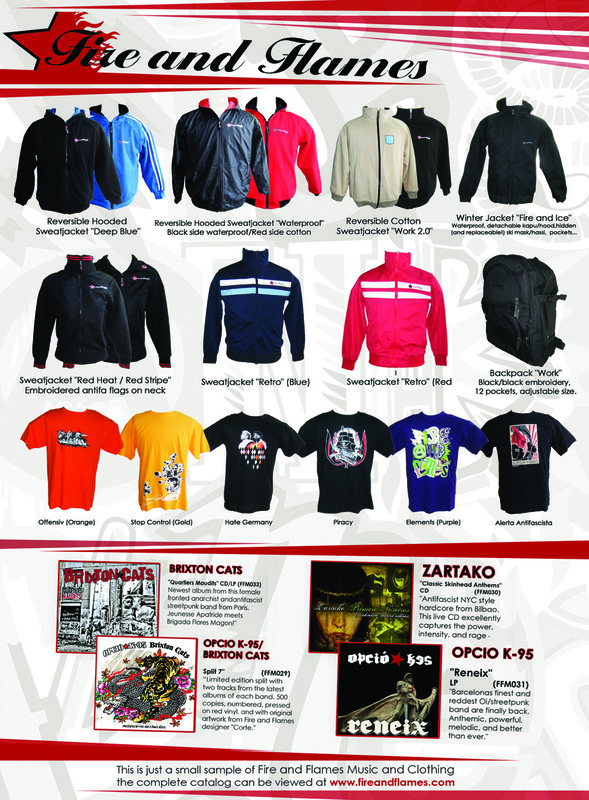 *The „Red Heat / Red Stripe“ sweatjacket! -The much loved “Antifa Agenda,” 2011 version. due to their political activities. They come on shiny heavy 300g paper, and are „elegantly“ designed. now always available and never expire! Go Crazy, and thanks for all the Support! Du browst gerade in den Fire and Flames Weblog-Archiven nach dem Tag 'talco'.